Its been quit too long that their were no blogger templates by me. 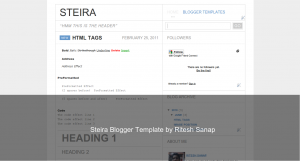 One day while surfing wordpress themes directory saw Steira WordPress Theme by Automattic. The theme was so nice , simple and good to look , so i decided to convert that one for my beloved blogger users who love to have themes from me. The theme is Minimal with white and Blue color .